Consolidation in the diesel engine building sector is partly a reflection of the sub- stantial capital expenditure required to maintain product development and techno- logical advance in a business characterized by comparatively low unit margins. By spinning-off new technical solutions arising from the engine design program into upgrading and conversion packages for existing populations of machinery, the manufacturer and licensor can gain more from R&D endeavors. 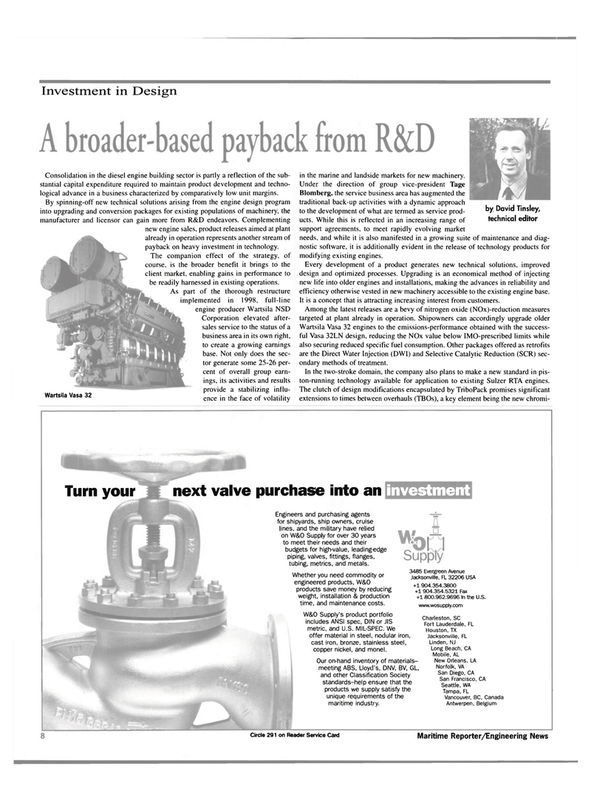 Complementing new engine sales, product releases aimed at plant already in operation represents another stream of payback on heavy investment in technology. The companion effect of the strategy, of course, is the broader benefit it brings to the client market, enabling gains in performance to be readily harnessed in existing operations. Corporation elevated after- sales service to the status of a business area in its own right, to create a growing earnings base. Not only does the sec- tor generate some 25-26 per- cent of overall group earn- ings, its activities and results provide a stabilizing influ- ence in the face of volatility Wartsila Vasa 32 in the marine and landside markets for new machinery. Blomberg, the service business area has augmented the traditional back-up activities with a dynamic approach to the development of what are termed as service prod- ^y David Tinsley, ucts. While this is reflected in an increasing range of technical editor support agreements, to meet rapidly evolving market needs, and while it is also manifested in a growing suite of maintenance and diag- nostic software, it is additionally evident in the release of technology products for modifying existing engines. Every development of a product generates new technical solutions, improved design and optimized processes. Upgrading is an economical method of injecting new life into older engines and installations, making the advances in reliability and efficiency otherwise vested in new machinery accessible to the existing engine base. It is a concept that is attracting increasing interest from customers. Wartsila Vasa 32 engines to the emissions-performance obtained with the success- ful Vasa 32LN design, reducing the NOx value below IMO-prescribed limits while also securing reduced specific fuel consumption. Other packages offered as retrofits are the Direct Water Injection (DWI) and Selective Catalytic Reduction (SCR) sec- ondary methods of treatment. In the two-stroke domain, the company also plans to make a new standard in pis- ton-running technology available for application to existing Sulzer RTA engines. W&O Supply's product portfolio includes ANSI spec, DIN or JIS metric, and U.S. MIL-SPEC. We offer material in steel, nodular iron, cast iron, bronze, stainless steel, copper nickel, and monel. Our on-hand inventory of materials- meeting ABS, Lloyd's, DNV, BV, GL, and other Classification Society standards-help ensure that the products we supply satisfy the unique requirements of the maritime industry. Engineers and purchasing agents for shipyards, ship owners, cruise lines, and the military have relied on W&O Supply for over 30 years to meet their needs and their budgets for high-value, leading-edge piping, valves, fittings, flanges, tubing, metrics, and metals.